Maori Wars is a simulation of the principal uprisings that took place between 1845 and 1872 due to British colonial incursions into native Maori lands on the North Island of New Zealand. Conflict involved the destruction of numerous villages, pas (strongly fortified villages that featured intricate trench-works) and colonial settlements. The war introduced the British to a wily well-armed enemy whose defense works and strategy of ambush surprised and stymied them. As scenarios progress so does the extent of the conflict. More British regulars, native born Australian troops and New Zealand militia enter and are allied with increasingly more tribes who tend to change sides at the most inopportune times (those supporting the British came to be known as Queenites). 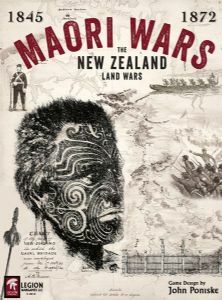 Historical scenarios feature low counter density, quick play time (under two hours), and features a novel bush-raiding rule that allows the Maori player to move units temporarily off the map and then back in a location of his choice. As the British player gains experience he learns to track these tribes. At which point he enters and battles these units in the bush. Maori resistance is dependent on village support so as fortified villages fall to British control, resistance melts away. Random battle dispatches reflect historical circumstances. Events such as: SEEK PEACE, NEW RELIGION, and CONCERNED TRIBES force players to deal with new and developing crises. The English may build forts but are penalized for fort-building as they historically caused local uprisings. Canoes and gunboats allow rapid transport and in the case of gunboats waterborne artillery support. Standard British artillery and cavalry are introduced but play only a minor supporting role. Terrain and knowledge of the terrain is the Maori’s secret weapon. Relative troop strength is designed to allow the possibility of historical outcomes not the proportionate historical strength. The overwhelming British superiority of men and firepower made the successes of the Maori forces all the more remarkable.